We’ve enjoyed Kenneth Arni’s wonderful photography for years. He travels a good bit, but his day-to-day operations are from his home at Fenwick Island, Delaware. 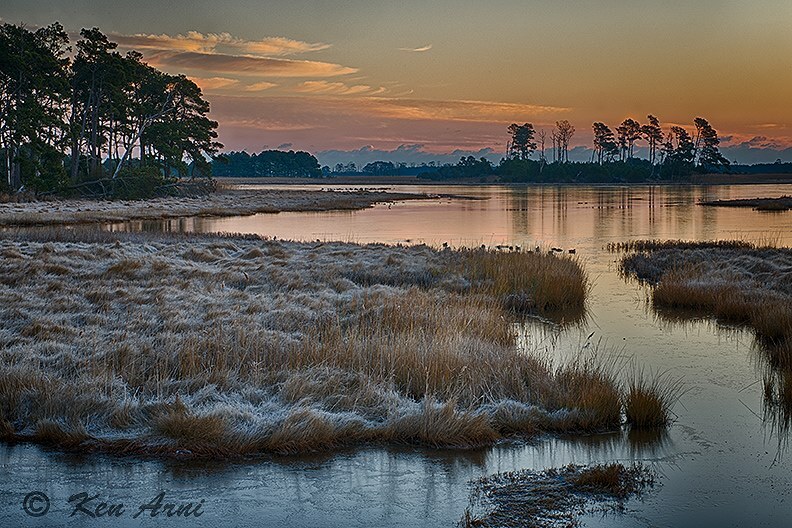 Most of his work runs from Bombay Hook, DE, south to Chincoteague, VA. My wife and I follow him on Facebook, and the first thing you will see here in the blog’s right column is Arni Photography, where you can view his work. His greatest treasures include wildlife, avian, and landscape photography. There are so many of his pictures that we’d love to have to enjoy, but we’d have to live in a gallery. Finally, we encountered this shot above from a Chincoteague marsh, with frost on the grass and glaze ice on the still water, and a beautiful sunrise. Christmas was rapidly approaching at the time, so I decided this picture on our own living room wall was to be our gift to ourselves. 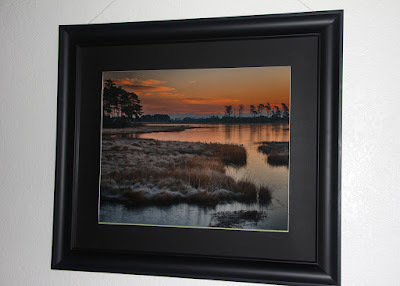 The Chincoteague Marsh matted and framed on our wall. Chincoteague strikes a chord with me for two reasons. One, if you enjoy oysters, Chincoteague is the gateway to heaven. My parents were friends with a couple in Chincoteague. The man was an oysterman. A couple times a year we would head down there to visit, and one of those trips would always be in late fall or winter so Dad could get a several gallons of oysters. Two gallons were always for us, and the balance would be for whoever wanted to chip in for fresh bivalves. For a young kid, the ride from Delaware to Chincoteague, on the Virginia Eastern Shore, was a road trip that never seemed to end. There were two compensations, however. The oysterman’s wife always had the table straining under a load of food that made the dining room look like Thanksgiving. The second was that my brother and I always got turned loose for the day. How much trouble could two young boys get into in a marsh? 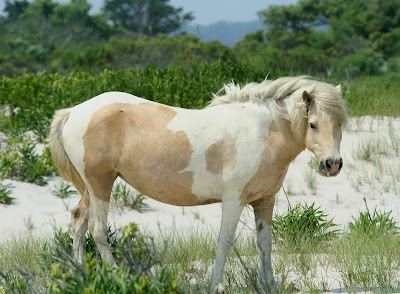 The Chincoteague Pony, also called the Assateague Pony. The second reason was to see the Chincoteague ponies. A small channel separates Chincoteague and Assateague Island National Seashore Park. The feral herd of ponies, which are actually horses, but called ponies because of their small size, live on Assateague. Since food is in such short supply on this spit of sand, there is a round-up each year so some ponies are culled from the herd to prevent starvation. The source of the ponies is a topic of historic disagreement. Some say the ponies swam ashore from a Spanish galleon that foundered offshore in a storm. Others believe that the first colonists kept them on the island to avoid the livestock tax they would have to pay if they were on the mainland, but that leaves the question of how the colonists got them. Maybe both stories are true. Oyster tongers at work in the shallows. Our favorite story comes from the oysterman’s false teeth. Perhaps unlike the pony stories, which can’t be proven, this story is true. Oystermen, especially tongers, live a very close hand-to-mouth existence, so when he got a new set of ‘store bought’ false teeth, it was such an investment that it was a huge deal. His wife had urged (ordered) that he not wear the false teeth on the boat to avoid the risk of losing them overboard. We don’t know why he was defying orders, maybe he just forgot to take them out, but he was standing on the side deck of the boat working his tongs over the side. The teeth still didn’t fit exactly right, and he was coming down with a cold. One sudden sneeze was all it took to send his upper plate overboard. He spent most of the afternoon tonging more for teeth than oysters. 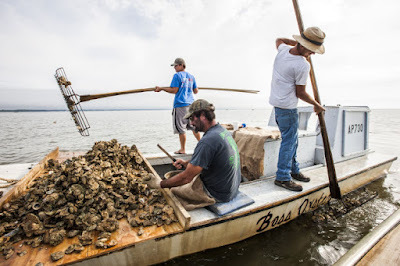 They not only represented a big financial loss, but he would catch holy hell from his wife every day from now ‘til death do us part.’ The rest of the story was picked up on the opening day of oyster season the following year. He went out to his favorite spot to start tonging. He dropped the tongs over the side, worked them, and pulled them up into the boat to dump the oysters on the sorting board. There, in the first tong of the year, was the upper plate of his false teeth. Domestic peace at last.